Cabbage rolls are kind of hard to describe. You have sweet, softened leaves of cabbage wrapping a filling, often rice or buckwheat. Since I had quinoa on hand, I thought, "why not?" That idea was a good one. I stayed close to the recipe for Meatless Holubtsi in the Ukrainian Daughters' Cookbook,* that my Baba gave me years ago. While not difficult, cabbage rolls are time consuming because there are three steps: cooking the filling, making the rolls, and baking them. The good news is that it is a good "potluck" dish, so if you give yourself three hours 'til mealtime and have it done early, it is fine to keep warm in a covered casserole. You can also make it ahead, either at the pre-baked prepped stage or after baking and warm it up. This is a half-portion from the original recipe, which was just enough for two grown-ups and tots. Double it if you'd like to see some leftovers. Bring the water to a boil, then add the quinoa. Bring it back to a boil for five minutes, put a lid on the pot, turn the heat off and let the water absorb for about twenty minutes. Meanwhile, soften the cabbage in boiling water for a few minutes. It will not take long as long as the cabbage is covered in the water. It should be just limp enough that you can easily pull leaves off the cabbage head. Pour off the water and let cool while you prepare the filling. The quinoa should take up all the water. To it, add the chopped onion, olive oil, salt and pepper. Preheat the oven to 350F and lightly oil or grease a lidded casserole. One at a time, take a cabbage leaf and place it flat on your table. Place a spoonful of filling on the leaf and roll it tightly, closing the ends. If you cut the cabbage in half like I did, your rolls will be smaller. Place each roll, side by side in lidded dish. Pour over the tomato juice. Bake for about ninety minutes. *The book is published by the Ukrainian Women's Association of Canada, Daughters of Ukraine Branch in Regina Saskatchewan, and has been out of print for years. If you happen to see one at a used book store snap it up. I shared this recipe at Real Food Wednesday, Gluten Free Wednesday, Monday Mania, the Homestead Barn Hop, Martha Mondays, Meatless Mondays, Tasty Tuesdays, Slightly Indulgent Tuesday, Fat Tuesday, the Hearth and Soul Blog Hop, Full Plate Thursdays, Allergy Friendly Thanksgiving and Fight Back! Friday. 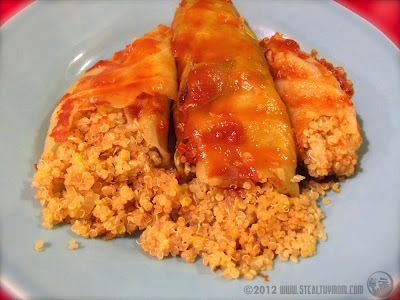 Oh we looooooooooove cabbage rolls, it's very traditional here, but I've never tasted them with quinoa. 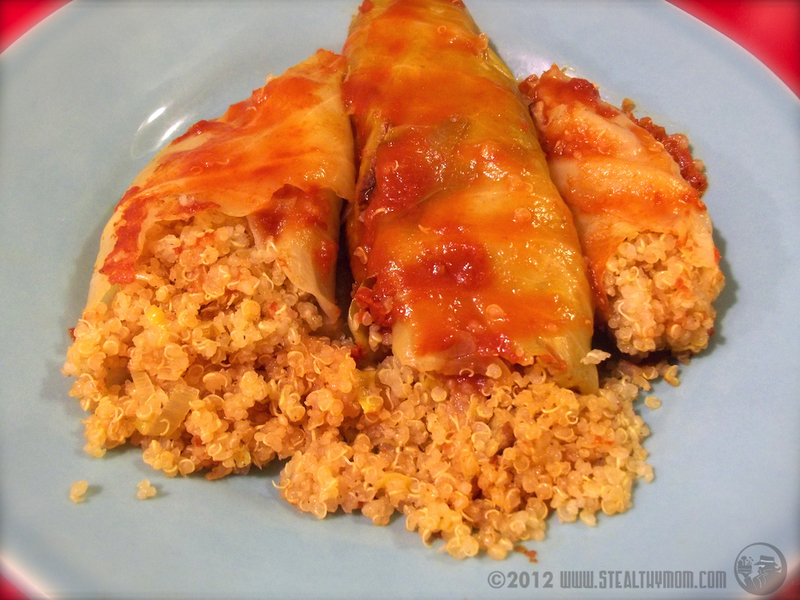 Cabbage rolls are one of my favourite comfort food meals, and I like the idea of making them with quinoa. Healthy and delicious too!